we set off today with a full wagon, and our minds on the west. We are headed for oregon. Me and my whole family have decided to make the trek. We faced our first challenge when we came to a large river. Though there was indeed a ferry, it was quite expensive. My family and I made the decision to ford the river. We crossed safely. Now thinking about it though, we maybe should have payed the ferry. Maybe we wouldn't be so lucky the next time. Next, we were faced with a decision. A Sioux Indian came up to us and offered a bargain. We gambled for our fate. Us and a few more wagon trains had to keep our legs up for quite a long time. I won though, and took home the prize of $150. I am glad that I took this challenge because I won. Day 2 of our journey has begun. A horse this morning was startled by a snake, and threw one of the members of our wagon train off his horse. His leg broke and we must now take time to mend it. We are also now running low on water. Some of us have extra barrels, but others don't. We must all learn to share, and conserve all of our water supply. We now come to another large river. we find a safe looking spot to cross, and we decide to take it. We assumed that it would be safe, but we thought wrong. Our wagon tipped on its side, and we lost about 100 lb. 's of valuable supplies. We then came to a fork in the trail. Our train, being adventurous, decided to take the faster,"burial trail", though indians were known to attack wagons. Our passage to the west has entered it's third day. We have found tragedy. Two of the members in our train have lost a loved one, and we deeply mourn them, but we must continue to move west. We have found ourselves at a river once again. Though this time it was different. This river was much quicker, and far deeper than the last two. I, being too prideful, decided to ford the river. Our wagon tipped, and my dear mother, Aunt Jemima, was swept away down the river. We never saw her again. This was probably the hardest moment on our journey to Oregon. We observed a moment of silence today. R.I.P. Aunt Jemima. Other than that, we had to change trails again. We decided to take the Massacre Canyon trail. On our final day of our journey, our fate will be decided. Today much happened. Our wagon train was attacked by Indians. We quickly circled back around, but lost some supplies. After much more traveling, we have finally reached the final mountain range. The passage is very dangerous, and very well might be closed by now. We were then faced with a difficult decision. We make the difficult decision to turn back and try and make it to the base camp. Though we are low on supplies, we make it back safely. When we return, the passage is much safer, but most of the land in the valley is gone. We are greatly disappointed, but we are also glad for our lives in tact. Canipe, Steve. 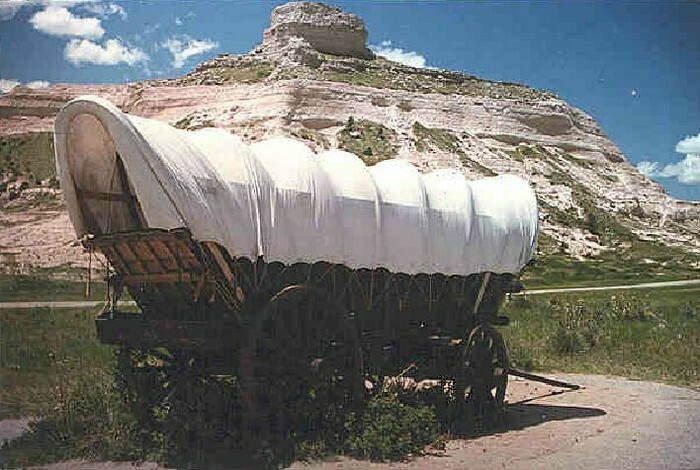 Scottsbluff Wagon. Digital image. Pics4learning. Pics4learning, 11 Jan. 2001. Web. 11 Mar. 2015. Kolk, Melinda. 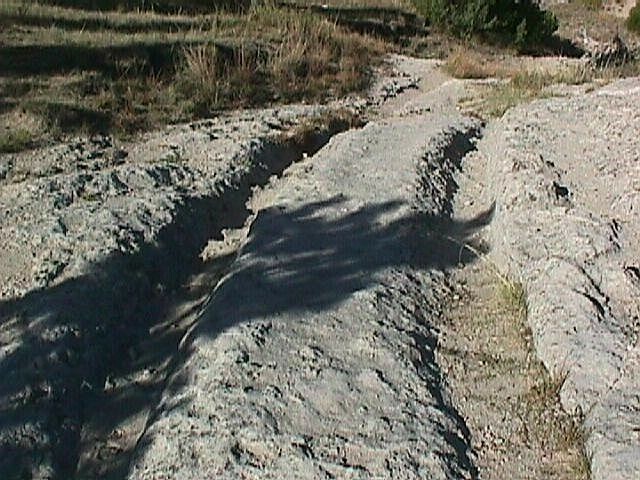 Wagon Ruts on the Santa Fe Trail. Digital image. Pics4learning. Pics4learning, n.d. Web. 11 Mar. 2015. Jenks, Daniel A. Rocky Mountains, Cherokee Pass. Digital image. Wikimedia Commons. Wikimedia Commons, 19 July 2009. Web. 11 Mar. 2015.